When you instruct a Solicitor or other lawyer and you place your trust and faith in them only to be let down you can suffer a financial loss and a loss of trust and faith in the legal professions and in the justice system itself. Needless to say the Solicitor or lawyer may not be prepared to accept that they have been negligent. As they are lawyers their response might appear to carry some weight and quite understandably, it can appear a daunting task, to fight a claim in negligence against them. With Matthew Wilkinson Solicitors, it needn't be. We are solicitors specialising in professional negligence claims against solicitors. We use all of our expertise to provide you with the best chance of a successful claim. Please call us now on 0800 043 9981 or dial 0333 577 0172 from a mobile or complete our Free Online Enquiry and we’ll be happy to have a no obligation chat with you and explain your legal rights and options. 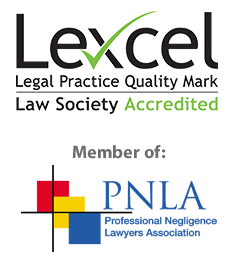 Your loss as a result of professional negligence by solicitors? Not every lawyer or firm is the same and if you have suffered a significant loss due to the professional negligence of a Solicitor, law firm or lawyer then we can help you to not only recover your rightful compensation but also hopefully help to restore your faith in the legal profession and the system of justice. Often it can seem too difficult or too complicated to put together a case against a Solicitor or lawyer, but that doesn’t mean you should give up! Instead get in touch with us to pursue your solicitor negligence claim and we’ll take care of things for you. Why Us For Your Professional Negligence Claims Against Solicitors? It is important to use an experienced team when it comes to making any sort of claim against a Solicitor or other legal professional because these cases are often complex and difficult and the Solicitors and lawyers Insurer’s will use many legal arguments to challenge your claim. It can be difficult to prove a legal liability to compensate you. However, our team specialise exclusively in professional negligence claims against Solicitors and other lawyers, which means that whatever type of claim you need to make we can help. All of our professional negligence cases are against Solicitors and other lawyers. With over 25 years experience in pursuing Solicitors negligence claims from all around England and Wales you can feel sure that our team of legal experts can help you get the compensation you deserve. We have experience of dealing with cases involving many different subject matters both advisory and transactional and in addition to the expertise of our Solicitors we are able to rely upon the additional expertise of specialist Counsel and other experts appropriate for your case, from our contacts built up over many years. We have a lot of experience in complex cases, which means that whether your claim involves Solicitors, Barristers or other legal professionals your claim will be in safe hands. With most legal matters it is important to take action sooner rather than later. We know that contacting a Solicitor can create anxiety itself, which is why you can contact us without obligation and without cost. Please call us on 0800 043 9981 or dial 0333 577 0172 if calling from a mobile. Make a Free Online Enquiry or contact us via email on enquiry@matthewwilkinson.co.uk we’ll have a no obligation chat with you about what you need and what you hope to achieve. We’ll happily answer any questions or queries you have and give you advice on how to progress your matter.